Power BI is not a new name in the BI market, components of Power BI has been in the market through different time periods. Some components such As Power BI Desktop is such new that released as general availability at 24th of July. On the other hand Power Pivot released at 2010 for the first time. Microsoft team worked through long period of time to build a big umbrella called Power BI, this big umbrella is not just a visualization tool such as Tableau, it is not just a self-service data analysis tool such as PivotTable and PivotChart in Excel, it is not just a cloud based tool for data analysis. Power BI is combination of all of those, and it is much more. With Power BI you can connect to many data sources (wide range of data sources supported, and more data sources add to the list every month). You can mash up the data as you want with a very powerful data mash up engine. You can model the data, build your star schema, or add measures and calculated columns with an In-Memory super fast engine. You can visualize data with great range of data visualization elements and customize it to tell the story behind the data. You can publish your dashboard and visualization tool in cloud and share it to those who you want. You can work with On-premises as well as Azure/cloud based data sources. and believe me there are much more things that you can do with Power BI which you can't do with other products easily. So, what is Power BI? Power BI is a cloud based data analysis, which can be used for reporting and data analysis from wide range of data source. Power BI is simple and user friendly enough that business analysts and power users can work with it and get benefits of it. On the other hand Power BI is powerful and mature enough that can be used in enterprise systems by BI developers for complex data mash-up and modelling scenarios. Power Query: Data mash up and transformation tool. Power Q&A: Natural language question and answering engine. Power BI Mobile Apps; Power BI supported in Android, Apple, and Windows Phones. Some of above components are strong and has been tested for very long time. Some of them however are new and under frequent regular updates. Power BI built easy graphical user interfaces to follow, so a business user simply could user Power Query or Power BI desktop to mash up the data without writing even a single line of code. It is on the other hand so powerful with power query formula language (M) and data analysis expression (DAX) that every developer can write complex codes for data mash up and calculated measures to respond challenging requirements. So if you've heard somewhere that Power BI is a basic self-service data analysis tool for business analysts and cannot be used for large enterprises systems, I have to say this is totally wrong! I've been using Power BI technology myself in many large enterprise scale systems and applications, and I've seen usage of that in many case studies all around the world. Power BI components can be used individually or in a combination. Power Query has an add-in for Excel 2010 and Excel 2013, and it is embedded in Excel 2016. The add-in for Power Query is available for free! for everyone to download and use it alongside with existing an Excel (as long as it is Excel 2010 or higher versions). Power Pivot has been as an add-in for Excel 2010, from Excel 2013 Power Pivot is embedded in Excel, this add-in is again free to use! Power View is an add-in for Excel 2013, and it is free for use again. Power Map is an add-in for Excel 2013, it is embedded in Excel 2016 as 3D maps. Power Q&A doesn't require any installation or add-in, it is just an engine for question and answering that works on top of models built in Power BI with other components. Components above can be used in a combination. 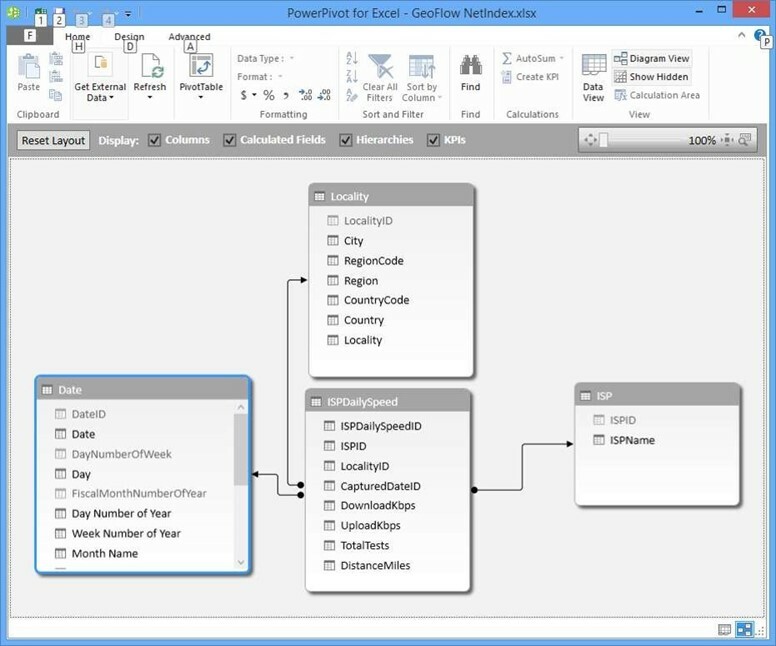 You can mash up the data with Power Query, and load the result set into Power Pivot model. You can use the model you've built in Power Pivot for data visualization in Power View or Power Map. There is fortunately a great development tool that combines three main components of Power BI. Power BI Desktop is the tool that gives you combined editor of Power Query, Power Pivot, and Power View. Power BI Desktop is available as stand-alone product that can be downloaded separately. With Power BI Desktop you will have all parts of the solution in one holistic view. To give you an overall view of what you would expect to see in each component I've put few explanation for each component here. There will be detailed description for all components later on in future chapters. Power Query is data transformation and mash up engine. Power Query can be downloaded as an add-in for Excel or be used as part of Power BI Desktop. With Power Query you can extract data from many different data sources. You can read data from databases such as SQL Server, Oracle, MySQL, DB2, and many other databases. You can fetch data from files such as CSV, Text, Excel. You can even loop through a folder. You can use Microsoft Exchange, Outlook, Azure…. as source. You can connect to Facebook as source and many other applications. You can use online search or use a web address as the source to fetch the data from that web page. 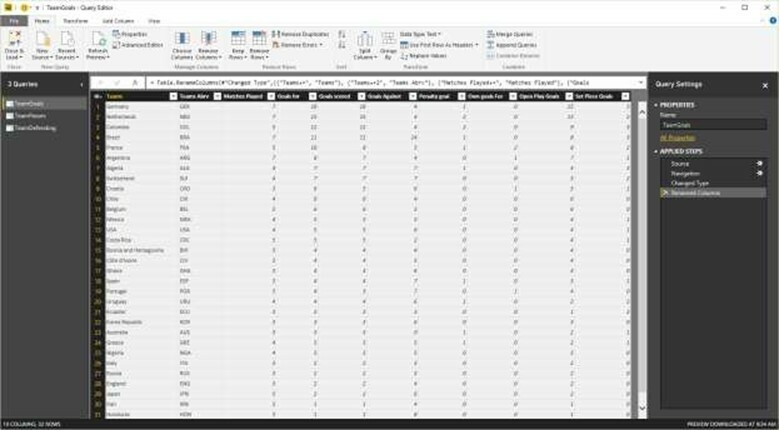 Power Query gives you a graphical user interface to transform data as you need, adding columns, changing types, transformations for date and time, text, and many other operations are available. Power Query can load the result set into Excel or into Power Pivot model. Power Query also uses a powerful formula language as code behind called M. M is much more powerful than the GUI built for it. There are many functionality in M that cannot be accessed through graphical user interface. I would write deeply about Power Query and M in future chapters so you can confidently write any code and apply complex transformations to the data easily. screenshot below is a view of Power Query editor and some of it's transformations. The main data visualization component of Power BI is Power View. Power View is an interactive data visualization that can connect to data sources and fetch the metadata to be used for data analysis. Power View has many charts for visualization in its list. Power View gives you ability to filter data for each data visualization element or for the entire report. You can use slicers for better slicing and dicing the data. Power View reports are interactive, user can highlight part of the data and different elements in Power View talk with each other. There are many configurations in Power View visualization that I will explain fully in future chapters. Power Map is for visualizing Geo-spatial information in 3D mode. When visualization renders in 3D mode it will gives you another dimension in the visualization. You can visualize a measure as height of a column in 3D, and another measure as heatmap view. You can highlight data based on the Geo-grahpical location such as country, city, state, and street address. Power Map works with Bing maps to get best visualization based on Geo-graphical either latitude and longitude or country, state, city, and street address information. 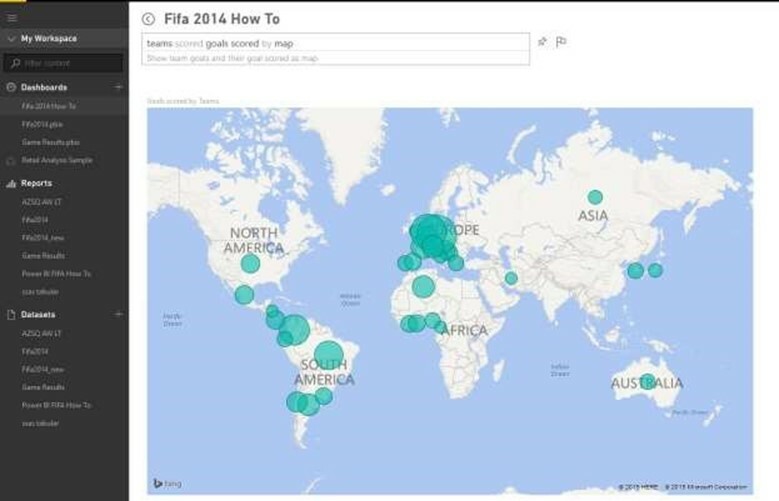 Power Map is an add-in for Excel 2013, and embedded in Excel 2016. Power Q&A is a natural language engine for questions and answers to your data model. Once you've built your data model and deployed that into Power BI website, then you or your users can ask questions and get answers easily. There are some tips and tricks about how to build your data model so it can answer questions in the best way which will be covered in future chapters. Power Q&A and works with Power View for the data visualizations. So users can simply ask questions such as: Number of Customers by Country, and Power Q&A will answer their question in a map view with numbers as bubbles, Fantastic, isn't it? There are mobile apps for three main mobile OS providers: Android, Apple, and Windows Phone. These apps gives you an interactive view of dashboards and reports in the Power BI site, you can share them even from mobile app. You can highlight part of the report, write a note on it and share it to others. Power BI provide these premium services for free! You can create your account in PowerBI.com website just now for free. Many components of Power BI can be used individually for free as well. you can download and install Power BI Desktop, Power Query add-in, Power Pivot add-in, Power View add-in, and Power Map add-in all for free! There are some features of these products that reserved for paid version however, such as Power BI Pro which gives you some more features of the product. If you want to learn more about pricing of the Power BI I encourage you to read this page. However create your free account today and give it a try, it won't cost you anything except your precious time, which I'd say definitely worth it. In summary, you've read about what Power BI is, and what are Power BI components. You've learned that Power BI is cloud based data analysis tool that can be used by data analysts, business analysts and power users because it is easy to use, however it is so much powerful that can be used to answer complex BI requirements. In next section I'll explain how to use Power BI Desktop for a Hello world example. You'll learn some great features of this product through a demo and you will have a better understanding of Power BI tools.